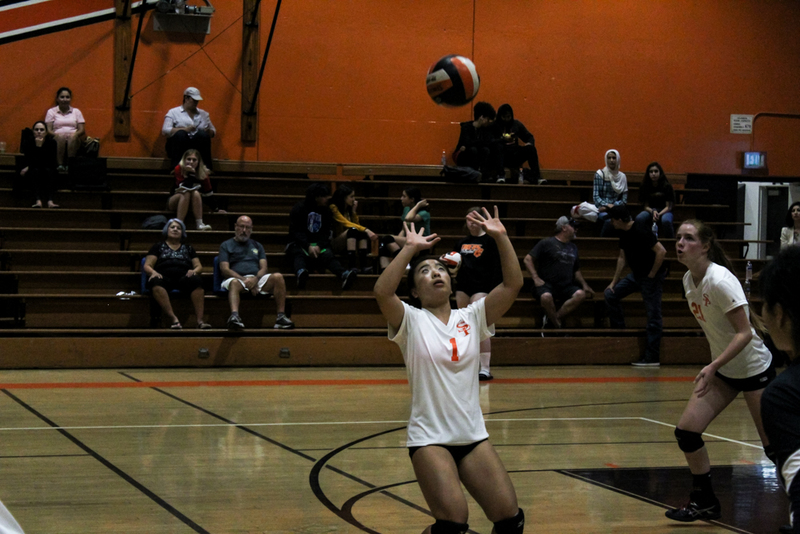 Sophomore Lindsey Hirano prepares to set the ball for a Tiger spike. Girls’ volleyball defeated the Temple City Rams in four sets in a road game on Tuesday, October 9. Their current league record is 7-2, good for second in the Rio Hondo League. Their final game of the season before CIF playoffs is tomorrow, October 10, against rival San Marino. The Tigers kicked off the first set neck and neck with the Rams. The front line struggled to save hits from Temple City, but eventually pulled through in the lead. Senior Lindsey Kuwahara was pulled in as a defensive specialist to help turn the set around. Freshman Kennedy Taylor and senior Christina Taylor also chipped in by blocking the ball, securing more points for SPHS. The Tigers closed off the set with a narrow 25-23 victory over the Rams. South Pas established an essential early lead in the second set against Temple City with strong plays on the front line. Although the Rams quickly caught up, strong communication on SPHS’ end helped the Tigers easily surpass Temple City. Senior Laya Jabalameli blocked an incoming spike from the Rams, improving their lead to 10-8. The rest of the set fell easily in the Tigers’ favor, as they won 25-14. The Tigers quickly fell behind in the third set and weren’t able to recover. Lack of communication on the court coupled with Temple City’s quick movements ultimately led to South Pas’ loss in the set. However, the Tigers didn’t go down easily, playing hard and staying close with the Rams throughout the set. Kills from freshman Ally Sokolow and sophomore Lola Foord almost turned the game in South Pas’ favor with clutch plays, but the Tigers ultimately lost the set 25-18. Determined to win the fourth and final set, South Pas started off strong with a powerful spike by Foord, the team’s opposite hitter. She continued to score for the team, blocking spikes alongside senior Ashley Hugasian. South Pas eventually pulled through and won the set 25-16. Girls’ volleyball will have a final chance to beat San Marino after a prior loss this season. Tomorrow’s game will also serve as Senior Night, as the team honors the seniors in their last home game.